This is one area we hit while playtesting the other night, the whiff factor. A lot of games start you off with a high whiff factor, with typical characters only hitting about 15-25% of the time. You can tell what this does, you typically get long fights with a ton of misses, and lucky hits decide the fight. In D&D, with an AC system that directly ties into to-hits, this is very pronounced. D&D4 had a system where level directly ties into the to-hit system; and it was very difficult to get hits in, especially if your equipment was not up to the level you were at, or if the monsters were 4 or more levels above you. We struck a middle ground, keeping whiffs high, but you can mitigate this and get a better to-hit through positioning. They aren't as high as beginning D&D, an average low level character has a closer to 40-55% chance to hit, which feels right. Armor does not subtract from to-hits, but there is a chance a blow that lands will cause little or no damage if the target's armor is high enough. An important note, and one we found is a necessity. All spells and powers require a to-hit, even beneficial party spells such as buffs and heals. Players used to modern MMOs and RPGs may find this strange, since beneficial spells are assumed to auto-hit. This is controversial, but needed for two reasons. In older MMOs like Everquest and other RPGs, you had to practice your casting skills in order to be able to cast your spell. This was critical, and training your ability to quickly cast spells saved you mana, and also ensured your character could get a spell off at a critical moment during a fight. This adds tension, and places an importance on training and making sure your spells didn't fizzle in combat. A lot can go wrong in combat when a goblin is trying to kill you, and making skill rolls to cast spells simulates a character's ability to work complex magics under pressure, without missing a word or misdirecting a spell. Misses still use mana, so it is important to train. Monsters that have healing powers also need to roll for them, in play testing, we found a goblin healer in the back ranks could tie up the combat for a long time by spamming heals. Putting an uncertain factor if the heal would land made the combats more fluid, and eliminated the chance for deadlocks and long combats. This is that chaos factor coming into play, and it raises the importance of high-skill healers and casters. Of course, the chance to cast is affected by referee-set difficulty modifiers, so if you are in the field with no monsters around, a referee could always apply a simple or trivial modifier to the casting roll, since there is no pressure to cast the spell quickly and without someone trying to kill your character. In combat, things change, and caster skill becomes an important factor. Highly skilled mages and healers are important allies, and also formidable foes. You need to go through these exercises when you design a game, so last night we kicked up a 7dRPG playtest as a dungeon game. Yes, 7dRPG will be a Steampunk game at heart, but the core will be used as the SBRPG2 engine. The game needs to work on the board, so play-tests like this help solidify the rules. Once we get all the tabletop rules worked out, these will be rolled into the base rules, and 7dRPG will benefit as well. You do find a lot of little things you forget to write down in these tests, little things you assume but don't write down, and you go through the rules making notes, adding sections, and clarifying rules to be how they were used on the board. Play-tests like these are a cleansing exercise, and they help tighten the game experience. We cleaned up a lot of little strange rules last night, and I will be making changes to the core document today. One thing we discovered is the importance of non-generic monster designs. We have this concept of 'generic monsters' where you can ballpark a monster based on a generic toughness level. Here, we spun our monsters up as generic characters, and they suffered two problems, being too tough and being too easy. These monsters were very bland as well, with no special skills, powers, or special attacks. Having a system where you can ballpark monsters to get them into a general toughness area is important, but you need to have a power list for them, and also a list of specific designs so you can have monsters with fun attacks and defenses to play with. We did nearly have a TPK party-wipe on the first play through, our group of three generic spiders were way too strong for our initial 3-person group. We adjusted things a little, but kept the strong monsters because we like the lower-level challenge to be high. If you start out a superhero, you never get that feeling of dramatic improvement when you start getting powers unlocked, and you become a capable fighting machine. In this session, only one character had magic, and the healer did not have any, relying on units of bandages and medical skill to keep the front line fighters alive. Cool stuff, and it gives you a really good benchmark to start from once your healing magic kicks in. Some of the assumptions you make in your initial design will be 100% wrong when you play it on the board, and we encountered this as well for some of the minor fiddly rules. You will sit there and write one thing, play it, and the obvious answer will be right there. You can't be too attached to a special rule, and you always need to be willing to throw rules overboard if they just slow down or confuse play. 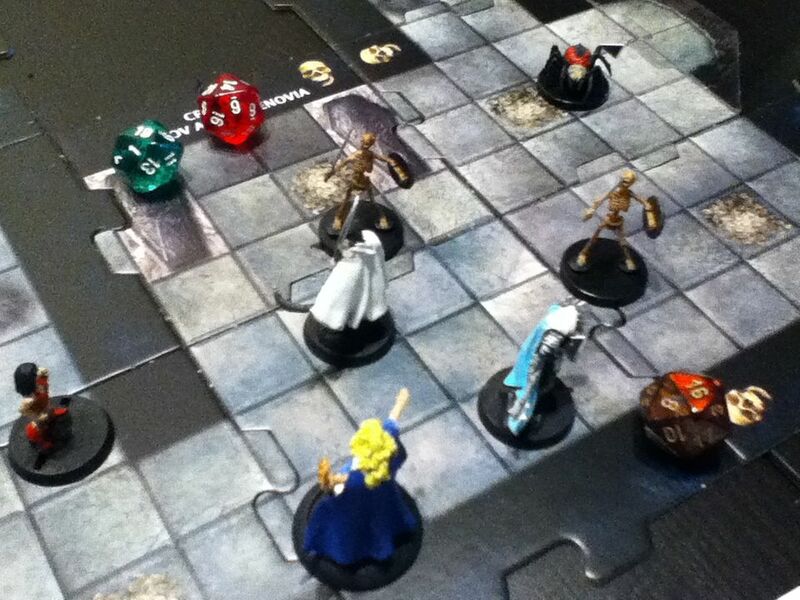 Oh yes, those are D&D Dungeon Command tiles with Pathfinder minis on them, along with some of our painted metal ones. Those dice are just incredible too, George's set of clears he just loves because they sparkle under the light. We throw together bits of random games to make ours, we do follow a BYOB styles of mash-up when it comes to tabletop gaming, and believe the tabletop game you play should support whatever random figures and bits you have at your house. If you have a party of 4 metal figures, a pack of skeletons, and a container of plastic spiders and ants, you should be able to play games with those pieces, make things up, and enjoy yourself without needing hundreds of dollars of 'official' figures and playing pieces. You should be able to mod those pieces to higher-level or specialized units, should your characters get experience and level-up. It's part of the reason our games have such a strong design and creation element to them, we are 100% believers in supporting your creativity and the playing pieces you have. 24 boxes to keep track of so far, beating out some old school pen-and-paper games already. Let's add the rest of the boxes in, all the way up to the saves. 19 More, bringing our total up to 61 total. Let's finish up by getting the rest of these down. Another 54, for a grand total 115 boxes on the front of our sheet. We haven't hit skills yet, so let's figure those into our total. A total of 239, plus about 10 boxes per power your character acquires (around 11, 17 at max level); so our 30th level character has about 409 stats to track. Let's have some fun and consider Labyrinth Lord's character sheet now. A grand total here of 32 boxes to keep track of. Basic Fantasy RPG anyone? 24 boxes total to keep track of a character, equivalent to Pathfinder's 4 x 6 rack for ability scores alone. Remember, these are all essentially the same 'dungeon' game. Granted Pathfinder has far more options and character builds, some pretty art, more spells, and tons of adventures written for it. It is still supposed to be the same "D&D" game though, and this stems from the bloat of character sheets inflicted on the game throughout AD&D, AD&D2, and D&D3. With each edition, the character sheet expanded to include more modifiers, more places to track numbers, and more hard data about the character that really has little relevancy in the 'adventuring in a dungeon' game these are supposed to be. This reminds me of the days where personal computers needed several different types of ports interfaces, cable adapters, disk drive sizes, and video standards. The world standardized on USB and the CD/DVD standard, and life got a lot simpler. To be honest, the bloat of boxes on character sheets is due to the complexity AD&D2 and D&D introduced with non-weapon proficiencies and then skills, and then all of the little fiddly modifiers that stuck to the game like lint along the way. I remember the days where a supposedly complex game like the classic Aftermath got absolutely panned for being too complex, and that only has 100 boxes on its character sheet to fill out. It always surprises me that through the years, the game has got simpler in the OGL clones, and more complex in the versions put out by the big players. Does the world want more complexity? Whatever happened to a game becoming simpler and easier to play in the next version? Good design means throwing out all the junk you don't need, simplifying things, and making the product easier to use. Apple gets it, it's why you don't see a RJ-232 serial port on an iPad, and worrying about hardware drivers for the thing. It just works, and you don't need to configure nearly 300 settings to get the thing to work. Where is that design theory in roleplaying games? Are we doomed to keep using machines and games that increase in difficulty with every revision, or is there a better way? Distaster Control: Sanity Wins, But Then What? Well, Microsoft pulled back their crazy whiteboard idea of limiting XBox1 game resales, sharing games, and even the always-on Internet connectivity thing. Expect the Kinect 2.0 requirement to fall soon as the retreat continues. Once a company starts pulling back, it usually pulls back a great deal. You know I couldn't stay quiet about this, since it plays into my theory of 'stupid whiteboard decisions' that should not have escaped into the wild. It happens to every company, including some I am familiar with. Did I say familiar with? Oh yes, I have been here too. After the pullback, when everyone is picking up the pieces from a disastrous series of decisions, and everyone is trying to make things right again. Trust me, there are a lot of people in Microsoft right now wondering what the hell just happened, worried about the future, and looking to make things right. We have to let those forces win, the gamers, QA people, engineers, and others who probably wanted no part of those crazy decisions, who are still excited about the XBox1, and want to make things good again. Am I actually pulling for them? Is this a ray of hope? Not totally. The decision getting out of the building is troubling, and it does signal troubled waters in the whole effort. This was a bad decision, and yes, this is why people get thrown under the bus. Rightfully so too, because the public needs to be told 'things are under control' and 'this is where things went wrong.' Oh yes, we need more here, a public admission of why this happened, and why it will not happen again. Bad things happen to good companies all the time, but the great ones are transparent, and let their customers know 'we screwed up' and how they are going to put in a permanent fix for it. I am looking for this shoe to drop from Microsoft, this will signal a change, and frankly I have been waiting for it to drop with some pen-and-paper companies. D&D Next's transparency and playtesting is a good thing, although it is going to take a while for me to put my trust in the D&D brand after the mess that was made of 4th Edition. Too many books, too much reliance on D&DI, a mess made with the errata, revising powers to the point where they broke character builds, and a lot more. I'd like to see some 'what we did wrong' articles from Wizards, I would find them fascinating; and also that goes towards the whole transparency thing that I love about great companies. It's also how I work, and who I like to work for. The XBox1 could be an awesome system, and consumers are very forgiving - but, and this is a big BUT, Microsoft needs to be honest with us. Lay out why they made those decisions, why they thought they were cool, what they would have done for us - and then admit they were wrong, things weren't focus grouped, and opinions were ignored. We need to hear it all. This begins the healing process, and helps us forgive. BUT, and yeah, that was a big but, we need that admission and that openness for us NOW to be able to put our trust in them again. Lay it out, do it now, don't hide things, and let's get this behind us. The longer it goes on, the more people will think this is just another half-step to make things right. Fixing a problem and not admitting you were wrong never truly fixes things. D&D 4E Character Builds: Pay to Win? This is not an article about D&D4 when you play by the first three books (DMG, PH, MM), this is an article about playing D&D4 as it was intended, with all books and options on the table. The game has expanded to include thousands of powers, feats, and equipment choices for each class, so complicated it practically requires the D&D Insider computer program to get a character design correct and ready for play. Add in the tsunami of rules errata for each and every book, and approximately a quarter of the powers and items, and there's no way to generate a 'legal' character without the program. Of course, you can still play the game without using the program, and hobble along from book-to-book picking powers and building a character. For many of the groups we played with, the time needed to get six players together, through all the books, questions answered, and characters built took an entire session, and even then most players made huge mistakes in creating their characters mostly due to the volume of material involved. We started out with the by-hand method, we enjoyed the tone and flavor of the first three books, and also built a lot of characters by hand. Of course, with just three books to worry about (and one PH), it was simple. Wizards built D&D4 with powers, feats, and items to exactly mirror the Magic Card format. Each power, item, and feat is its own self-contained card of rules, and there are literally thousands of them, with many revised. In the end, you ended up dealing with something like a huge box of Magic Cards in complexity, and in-play, it introduced a certain type of choice paralysis among our groups. Similarly, many of the powers were slight variations of each other, meant to ensure a certain power type could be used more than once per encounter (all the melee-shift-rogue powers come to mind, plus many others). There are too many powers that are too similar to each other, but that is for another day, another discussion. Along comes the D&D Insider program, which became the de-facto way to generate a character. It's a great service, and keeps you organized, your characters in one place, and all your rules up-to-date. It also became the only way to play for our groups. Creating characters by hand took too long, and the mistakes made brought the game to a halt when a player discovered their character wasn't right. It was a negative experience for the player, since the player wanted to do the right thing, but preferred the by-hand system. After a while, players didn't like the online generator, because they felt it was the only way to go, and they liked using the books. We also ran into the online program taking longer and longer to use, since the options increased as you leveled up. For play time, the online character generator was the only way to go - maintaining characters by hand simply took away all of our play time and was too error-prone to even consider (especially for new players). Clearly, the game is to blame here, and this is one of the major mistakes in D&D4. The designers wanted that 'Magic Card' vibe when it came to selecting powers and gear, and they even printed 'power cards' intended to make this easier (and those got outmoded with errata to an extent). This created a necessity to use the program to save time for play, players that used it were happier, did better, and had a more enjoyable play experience at the table. If that sounds like a pay-to-win game, it sort of does. You are paying for the premium experience, of course, but players who didn't pay ended up with a net negative experience with the game. In most pay-to-win games, you can at least stumble along with the freebies, but your experience is still marginally positive. Here it seems like that, or a little worse off for non-paying players, especially when you get a mix of paying and non-paying at the same table. The differences between the two types of players were striking, and there were issues between paying players who had correct designs, and those who did it by the books and were playing with incorrect and sometimes characters with errata issues. A paying player saying 'oh, it doesn't work that way now' to a non-paying one was the kiss of death to about a half-hour of play-time every time it happened. Now yes, the service helped, so it had value and was worth paying for. Something in the back of my mind wonders what would happen if the game was easier to play, easier to build characters with, and didn't require such a huge character generator to begin with? The game design of D&D4 in respect to character builds made the D&D Insider service a necessity, and in a way, it fostered the complexity of the game. You could have had the same D&D4 experience with less complexity, but of course, there wouldn't be a need to pay for D&D Insider either. Yes, it's totally within Wizard's right to get subscription fees for a value-add service, but part of me wonders if this was the right way of going about that. The problem was, you didn't need the books, they were errata'ed away, all you needed was D&D Insider. If you didn't like the program, or you lapsed from playing and cancelled your D&D Insider subscription - you were out. There wasn't a great way to get back into playing without reactivating your account, and it felt like your characters were locked away behind a paywall. It was easier to play another game without the onerous character generation requirements than it was to get back into the program, find out most of your character designs were changed by errata and had to be redesigned, and deal with the constant attention a D&D4 character required. For many, Pathfinder or the OGR clones provided an escape to a simpler time where you could design a character by hand, and many went that way. Of course, Pathfinder is less simple nowadays for other reasons, and that is another topic for another day. 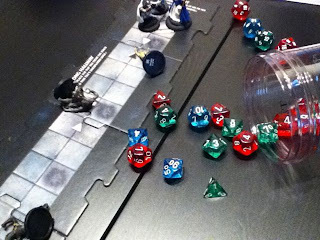 Many other RPGs provide that simple experience, and the interest in D&D4 faded away in our group. People just wanted to show up and have fun, and the stacks of Magic Card like powers and gear got in the way, the character designer becoming the focus of the negative experience. If it were up to me, character generation would be free and open - anyone should be able to log in and use the service. After all, you want people to create all sorts of fun character designs and dream about the possibilities. What I would pay a subscription fee for is a place to meet up and play, for a RPG-focused social network with virtual tabletops, hangouts, adventure creation and tracking, and yes, a place to share characters, stories, and achievements. I would pay to unlock maps of worlds, party tracking, wikis, and adventures to play online. It seems Wizards went in the wrong direction, locking up characters behind the paywall. To me, it would have made a lot more sense keeping the characters simple, and making the value-add proposition the place to come and play the game with fans around the world. The latest spat between the XBox1 and the Playstation 4 got me thinking, especially under the topic of used games. Now yes, I know this doesn't have much to do with pen-and-paper, but stick with me, it will in a moment. I'm not looking to start a flame war between PS4 and XB1 fans, just make a point. Microsoft seems like they lost touch. Clearly, their odd restrictions on used games with publishers being allowed to allow or disallow this, and the further limit on 'who' gets to sell used games is just strange beyond belief. Then add the strange 'games can only be traded once' deal, the Internet requirement anywhere from a day to each hour depending on where you are, and all of a sudden, your users have it worse off than the game pirates. Yes, the restrictions are like Steam, but Steam is even freer than this, and plus Steam wins on price every time. With the PS4, it's easy, Trade your game, sell it to anyone, rent them (a huge casualty in the XB1, no Redbox or Gamefly), but pre-owned, trade them in for the next year's big thing - whatever. Oh yeah, I expect publishers to continue the practice of downloadable pay-per extra content and online passes, but that's their choice and not forced on us as gamers. The system is kept simple, free from online activation, some sort of trading scheme, or any other artificial limit - things work like they always did. I've been in this place before, it's called a corporate meeting room with a giant whiteboard where managers try to one-up each other with crazy ideas, pet projects, power blocks, and tons of other hair brained schemes that should never make it out of the building. That's okay though, a business needs free thought and to be able to try new things internally, along with come up with new ways of doing things. With guidance, the best ideas will rise to the top, and the company presents a unified plan that works for everybody. Pivot now, and think about pen-and-paper RPGs. There are plenty of strange whiteboard craziness that escaped pen-and-paper meeting rooms in the last few years, the pullback of the OGL to GSL being one of them, the elimination of electronic rights from the SRD/OGL, the Pathfinder Basic Box not being licensed as a base product to expand upon, and a whole bunch of others. Put some trust in your users if you want them to play your games, aka the PS4. As a creator of games, yes, you do want to worry about sustaining your product; but you also need to make your entire ecosystem friendly and open. The D&D 3.0 to 3.5 OGL was a remarkable achievement, but it did not go far enough. As pen-and-paper game creators, your #1 job is creating a healthy ecosystem where everybody can join in, be creative, and play. With games like Labyrinth Lord, Basic Fantasy, and the other OGL clones, you can even write and sell your works as a third party for those games - without the publisher's approval. You can even do that with Pathfinder (paper and PDF products only), provided you follow the SRD's restrictions. In an open system, freedom is celebrated, and people that want to participate in the 'game economy' can do so without restriction. With video games this means we support rental services, used game sellers, swap meets, and even friends that want to trade games with each other. With roleplaying games, it means creating a great base system, and then opening it up for everyone to play, buy your stuff, make money from, and enjoy. The great success stories in technology have always been from open systems with wide support (Android, iOS applications, Windows/Mac applications, etc). Where are our great open systems in roleplaying games? What will the next great success story be? The best way I can describe this is buying a new computer. When you buy a computer, you aren't done paying for it. No, I am not talking financing it, but there are costs that continue to get charged to you in one way or the other. Even if you have a computer, you are still getting charged these costs. Now, I am defining 'cost' here broadly, it is not only money, but it is time. Now intrinsically, both are the same, as all money is is a way 'labor' can be stored and monetized but that is beside the point. Let me start off by saying your time is usually more valuable than your money. Let me say then that nobody is paying you for the time spent in the above list. You can have the best computer in the world, but if you are spending more time fiddling with it, learning it, and updating it - it is eating more of your time than it is worth. The only time spent on a computer that is earning you value is when you are either being productive or playing a game - the things you bought the machine for in the first place. Everything else is a cost to you. I know some people enjoy some of these parts, but we are using the measure of 'play time is gold.' Now many games purposefully increase these time costs as a part of a system lock-in strategy. With computers, you normally want to reduce the time costs - increasing them is a hassle and makes the computer not worth owning. For pen-and-paper games, if a rules system is ultra-complex and all-encompassing, you literally don't have the time or the energy to learn or play anything else. You always can, of course, but some systems enshrine complexity to the degree where you have to make a mental commitment to play only that, and nothing else - especially if your friends have invested as much time as you have, or even more. Pathfinder and D&D 3E and 4E follow this model, and do quite well at it. Part of the problem is that it is easy to walk away from a simple game - you have little invested in it. This time and money investment is a huge part of marketing games such as Warhammer and 40K, the buy-in costs to buy, assemble, paint, and create armies is very high - and thus the lock in for players is as well. Same thing with pen-and-paper games. If you own a shelf full of gaming books of a system, you are locked in, both with a money cost and a time cost. Is the time-wasting tactic used for system lock-in bad? Well, for computers, it is. Part of what makes Windows such a giant is that you have to spend so much time with it to keep it running. Owning that computer takes so much mental effort worrying about it, it almost creates a parental dependency between user and machine. The computer is helpless without your attention, and this creates a sort of system lock-in as well between you and your computer. You want to play the latest games and get work done, so you accept the time costs involved with that. If there were computers out there where you could do the same things, but for less time and hassle - would you walk away? People are walking away from this model today, and thus Windows as well. Tablets and iPads are replacing the web browsing and email needs for many desktop owners that don't need all that power. Android is a more open ecosystem with greater freedom and less hardware support time requirements. Chromebooks are 'zero time cost' computers that just open up and work, without worrying about driver updates, system security, file formats, or software functionality. Of course, in a Chromebook, your files are locked-in to Google's ecosystem, but they allow you to use other storage providers (Dropbox, etc) as well, so there is still freedom to store files where you wish, provided you want to spend the time doing so. Are people walking away from complicated pen-and-paper games? Well, World of Warcraft decimated D&D like Magic the Gathering decimated, well, D&D (a long time ago when Magic first came out, and it was easy and fast to get into and play). MMOs give players a higher 'value add' time than a pen-and-paper game, you can log in and immediately start having fun. You don't have to spend hours maintaining your characters in separate computer programs, learning volumes of rulebooks, or finding other players to play with you. All of that is just there. In fact, MMOs that purposefully reduce costs in the time needed to learn, and also the costs needed to play (free to play) often do better than ones requiring a huge time or money investment up front. What does that say for complicated pen-and-paper games that are getting more expensive in both the cost of books needed to play, and the time needed to support them? Is the pen-and-paper gaming industry going in the wrong direction with more expensive games, especially in this free-to-play world? Just because dinosaurs leave large tracks doesn't mean you should follow them. The next big thing in pen-and-paper games will follow the free-to-play model. Simple rules, optional upgrades, minimal upkeep time, and zero-entry cost. None of what I see in D&D Next, Pathfinder, Star Wars, or any other upcoming release fits that model. In fact, the system lock-in of the older games, Pathfinder, D&D4, D&D3, actually keep people from wanting to learn the next big complicated thing that comes out. The giant dinosaurs fell to the smaller and faster ones that could adapt and move quicker, they weren't replaced by even larger dinosaurs that ate more resources. It is one of those game-design issues I ponder about on a lazy day, looking at shelves of games beckoning to be played, but taking so much time the activity seems like a waste...of time. Are we going in the wrong direction? Where is the next big thing? Will it even look like those games on the shelf next to me?